The Garden Club currently has 233 members, divided into 9 circles. These circles meet monthly at different times of the day or evening, generally from September through May, and programs are planned to educate members on such subjects as gardening, floral design, and horticulture. Annual dues are approximately $65.00. 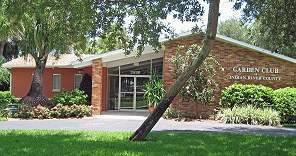 Members are expected to assist in all major activities of the Garden Club of Indian River County as well as those of the individual circles, including maintenance of the Garden Center and the beautiful garden located behind the building. Copyright © Garden Club of Indian River County, Florida - All Rights Reserved.